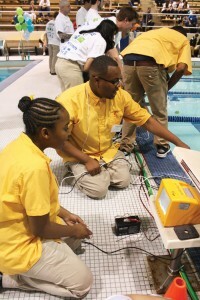 Drexel University hosted the first annual National SeaPerch Challenge, which challenged competitors to build aquatic robots to compete in a variety of events, in the Daskalakis Athletic Center May 23-25. The robot, or SeaPerch, is made out of polyvinyl chloride pipe, basic motor and steering components. It was developed by the Massachusetts Institute of Technology and the Office of Naval Research as an educational tool that can be sent to schools as ready-to-build kits. Teams are allowed to modify their robot with attachments to gain a competitive edge in the timed challenges. According to Susan Nelson, executive director of SeaPerch, the two-day event was the culmination of a four-year initiative that started with 750 students in a handful of regional competitions and grew to a nationwide program with over 27,000 students. The event marked the seventh SeaPerch event that has taken place on Drexel’s campus since 2005. The first event consisted of a teacher-training seminar where Drexel and Navy officials developed rules for interschool competitions. Bruce Eisenstein, interim dean of the College of Engineering, said that even though his college does not have a naval engineering program, many of its departments – electrical, chemical, mechanical and materials engineering – all play important roles in the sector. “Our association with SeaPerch has built ties between Drexel and the ONR while fostering the next generation of engineers and scientists,” Eisenstein said. The event was a part of Philadelphia Naval Week, a public outreach campaign to raise public awareness about the Navy and its activities. Sailors from the USS Pennsylvania came to lend a helping hand along with other high-profile Navy officials. Dr. Michael Kassner, director of research for the ONR, said that SeaPerch is the keystone educational outreach program for ONR. “We are proud to sponsor this program and see the future of naval technology being cultivated by the hard work of students and teachers,” Kassner told teachers and students. Rear Admiral Scott Weikert, a 1981 Drexel graduate in electrical engineering, said that there is a vital need to encourage science and engineering in America’s schools. “When you look at international rankings, the U.S. is lagging significantly in math, science and engineering. These fields are very important to our country because the Navy is so technologically advanced. There is an immediate need to continue innovating. I think an event like SeaPerch is a great way to get kids interested in these fields,” Weikert said. Robotics teams from as close as Baltimore to as far as Pearl City, Hawaii, competed in the event. George Kapusinski, a robotics teacher at Mount St. Joseph High School in Baltimore, brought five students to the competition. “Most are interested in some kind of engineering field, and this is the perfect transition into their college career,” Kapusinski said. Highlands Intermediate School, located in Pearl City, Hawaii, had the longest trip to campus. For Amy Martinson, principal of Highlands, SeaPerch fits perfectly into her school’s science, technology, engineering and math-based curriculum, known as STEM. “We encourage students to compete in national and international competitions all the time. The inclusion of the oil well challenge at this one is a great way to incorporate a current event, I think it has the students even more interested,” Martinson said. Martinson and Highlands science teacher Kathy Lin traveled with four seventh grade girls to Philadelphia. Apart from exposing them to engineering concepts and developing problem solving skills, the competition also brought the young students to a city they had never seen before. “We always make time to walk through college campuses when we travel and encourage our students to learn about the school and its programs. We also went to Independence Hall, which was great because it was something these girls only knew about from a textbook,” Martinson said.